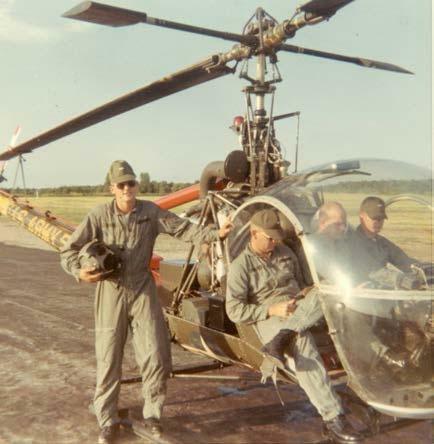 From Basic Training, we who were going to Rotary Wing Flight School were bused to Ft. Wolters, Texas, which was the Army’s primary helicopter training base. After several weeks of “preflight” which was all classroom instruction, our flight training began in the very touchy helicopter. Those things are not meant to fly and are very difficult to learn to fly. We went through flight school in officer candidate status (Warrant Officer Candidate), so in addition to flying, one had to endure the hazing, harassment and inspections which are all a part of being an officer candidate. But, assuming you did not flunk out due to academics, or get thrown out for having too many demerits, and had the requisite hand-eye coordination and grit to fly the helicopter, one day you soloed (a big day), and went on to complete Primary Helicopter. I went to Hunter Army Airfield in Savannah, Georgia for my advanced training. There, we had some training flying on instruments, transitioned into the iconic UH-1 Huey helicopter, endured “Escape and Evasion” training, learned tactics, and graduated from flight school. On completing flight training, I was commissioned a Warrant Officer and received my silver Army Aviator wings. Our graduation party was quite a blowout. Everyone was there...classmates, wives, girlfriends, fiancees, family and training cadre. And, the 30 or so of us who had made it. We’d suffered together, persevered and survived “candidate” status. It was great, and it was bittersweet. Our class was about to be split up. Wives, girlfriends and family would go back home, and we’d go to Vietnam. Some of us would fly together in Vietnam, deepening our bonds. Some of us would die there. Some of the class would become lifelong friends, as has been my experience and privilege. At graduation, all the WOC’s who had survived 10 months of being an officer candidate and flight school were commissioned Warrant Officer 1 (WO1). Nearly all the class took their oath, administered en masse by our Company Commander (a captain). However, any military officer can administer the oath commissioning another officer. A few of the class had their oath’s administered by family members or friends. Pop administered mine. And, of course, Pop had on the only Navy uniform in the hall…and a Commander in the Civil Engineer Corps, at that! It was a proud moment for both of us. Now that we were officers, we could become Army Aviators. In a separate, following ceremony, we WO1’s became Army Aviators. Then our class all filed out of the building where an enlisted member of our training cadre saluted each brand new baby Warrant Officer, our first salute. Each of us returned this first salute smartly and gave the sergeant a silver dollar…a tradition of an officer receiving his first salute. The scene was very similar to Lieutenant Zack Mayo (Richard Gere) and Sergeant Foley (Louis Gossett, Jr.) in “An Officer and a Gentleman.” Yes, there were a couple of Debra Wingers there too.